A simple but beautiful handcrafted wedding invitation featuring a material panel with embroidered champagne glasses mounted onto deep red card surrounded by a gold outline trim on a white card, comes complete with a white insert printed with all your wedding details and a white envelope. 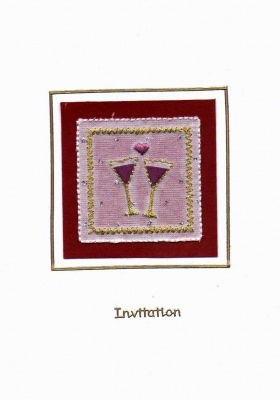 This wedding invitation is also available as an evening invitation, engagement invitation or anniversary invitation. A sample is available.